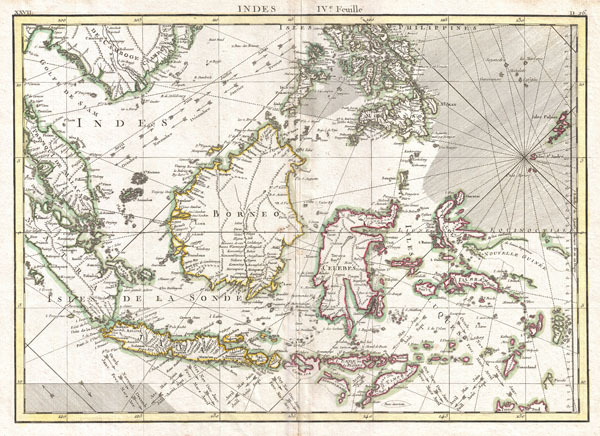 A beautiful example of Rigobert Bonne's 1771 decorative map the East Indies. Covers from the Gulf of Siam (Gulf of Thailand) and Malacca (Malaysia) eastward to include parts of Sumatra, Java, Borneo, the Celebes, parts of Cambodia, the southern Philippine Islands, and New Guinea. Offers considerable detail of the region. Notes the Straight of Singapore (Det. de Sin Capura) and shows but does not label the island of Singapore. In Borneo, this map provides good detail along the Banjermassin or Barito River, detailing numerous villages and trading stations. Names Bali and Lombok as well as Batavia. Several of the southern islands are drawn with their southern shores ghosted in - suggesting an uncertain coastline. This is also the case with much of New Guinea (Nouvelle Guinee), which was largely unexplored well into the 19th century. Rhumb lines throughout. Arrows in the lower right show the direction of prevailing winds during the dry season and the monsoon season. A fine map of the region. Drawn by R. Bonne in 1771 for issue as plate no. D 26 in Jean Lattre's 1776 issue of the Atlas Moderne. Rumsey 2612.056. Phillips (Atlases) 664. National Maritime Museum, 215.